My husband, Matt will tell you that this the best peach cobbler in the world! 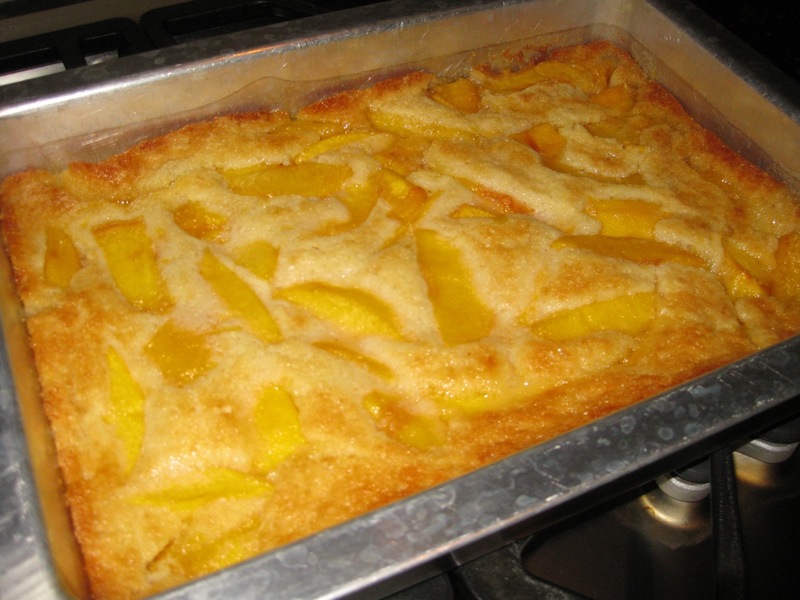 Recently my mom made this cobbler for dessert, but Matt had to work late and couldn’t attend. Later that night, I brought home leftover cobbler, and Matt demolished the pan, which is uncharacteristic for him. He is not a leftovers type of guy, so I was shocked to see the pan empty! Just three days later, my parents invited us over for lunch after church and my dad grilled out Chateaubriand Steaks, as usual…yum! For dessert, Matt suggested Peach Cobbler again! Usually I would never ask for a dessert three days after having just had it, but my mom’s Peach Cobbler was even better the second time! I think she increased the baking time a few extra minutes, which made the crust a little crispier and even more buttery! Try this recipe for you and your family. I promise it’s the easiest Peach Cobbler you’ll ever make, and the taste is extraordinary. We used freshly sliced peaches, but if you’re lazy, or don’t have fresh peaches on hand, feel free to use canned peaches. Just don’t sweeten them with sugar and water over the stove like you would the fresh fruit. Finally, don’t forget to serve this cobbler hot with a big scoop of vanilla ice cream. When you’re done, store the cobbler in the refrigerator (if you have any leftovers.) 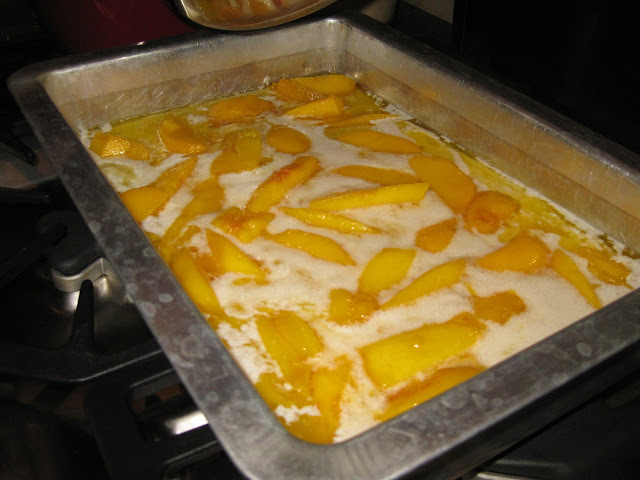 As a kid growing up, my favorite part about Peach Cobbler was eating it cold out of the refrigerator the next day! It is surprisingly good cold. Enjoy! For fresh fruit only, sweeten peaches with sugar and water in a sauce pan. Meanwhile, mix flour, sugar, baking powder, and salt. Gradually stir in milk and beat until smooth. 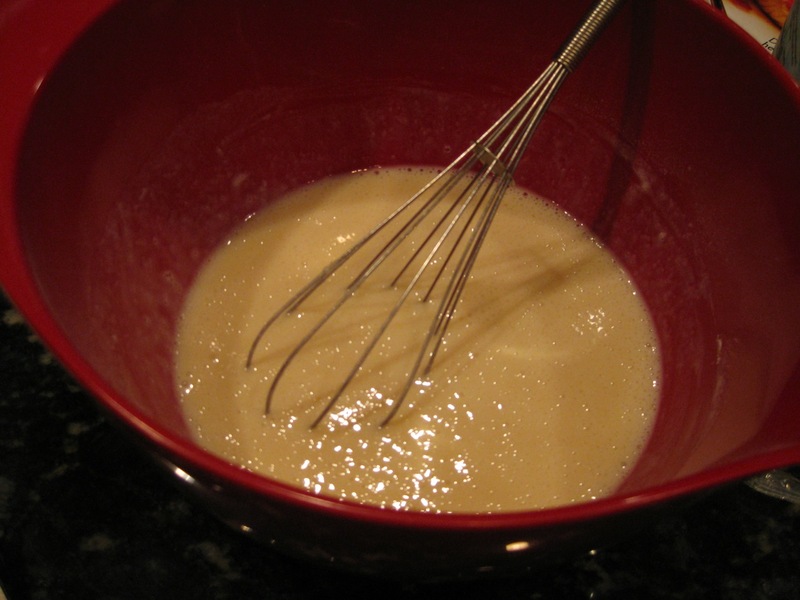 Pour milk mixture over melted butter. Spoon peaches on top. 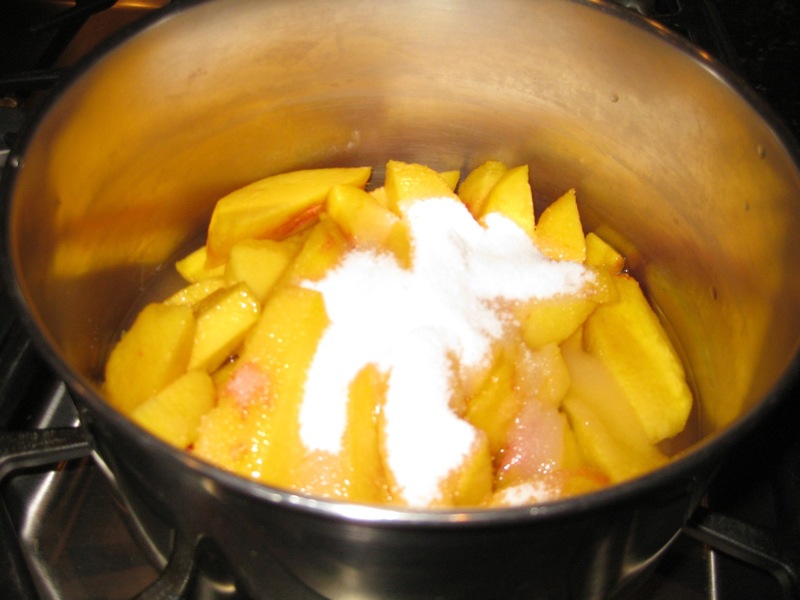 Do not stir peaches into the batter. Bake for 30 to 40 minutes in a 375 degree oven. 1. 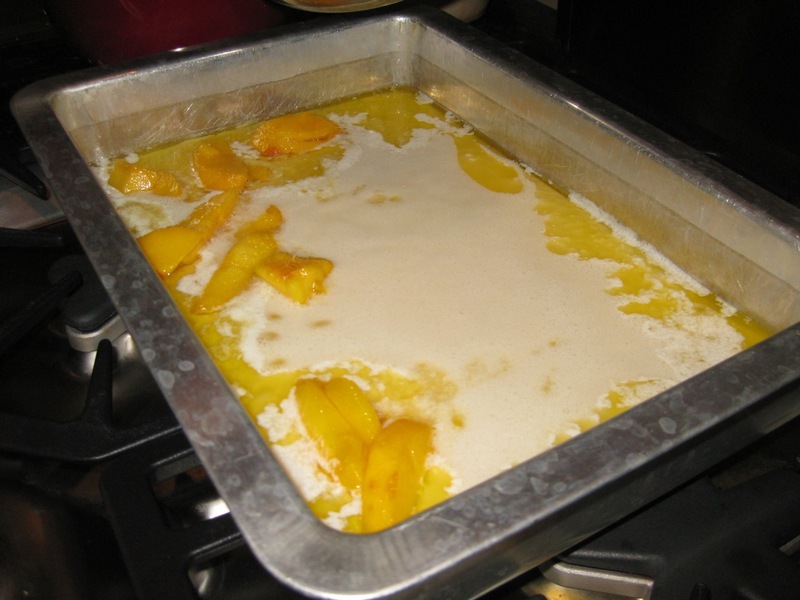 Melt butter in a 9 x 13-inch pan in an oven, preheating to 375 degree F.
2. For fresh fruit only: heat sweetened fruit and water in saucepan. 3. 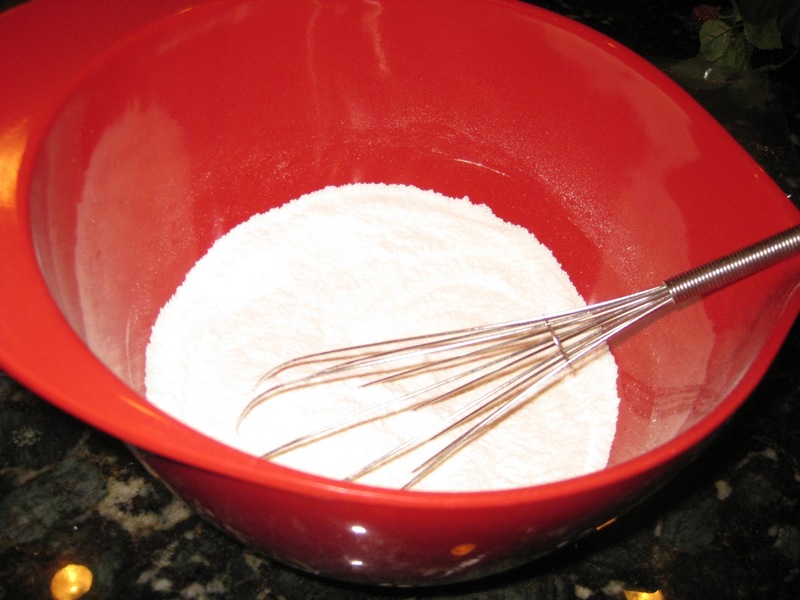 In the meantime, mix flour, sugar, baking powder and salt in mixing bowl. Gradually stir in milk and beat until smooth. 4. Pour over butter and top with fruit mixture. 5. Bake for 30-40 minutes at 375 degrees F.
One Response to "Peach Cobbler"
This recipe sounds a lot different than most peach cobbler recipes that I have tried. I think I will add cinnamon to this. I hope it is just as delicious as it looks.